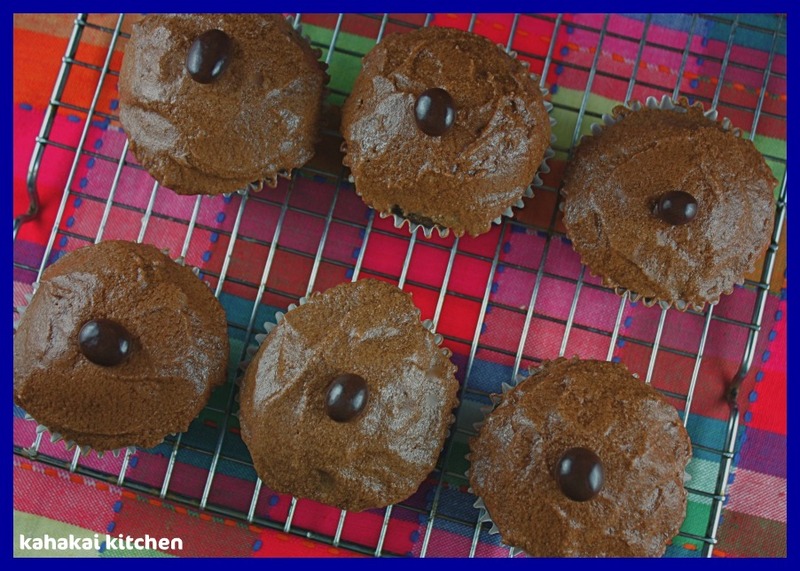 Chocolate cupcakes may seem redundant when we have already made brownies with chocolate buttercream and chamomile cupcakes for the Joy the Baker Cookbook Spotlight and Cookoff. Still, when I got to choose a recipe to make for Blogger's Choice Week of the challenge, this is the recipe I kept going back to. 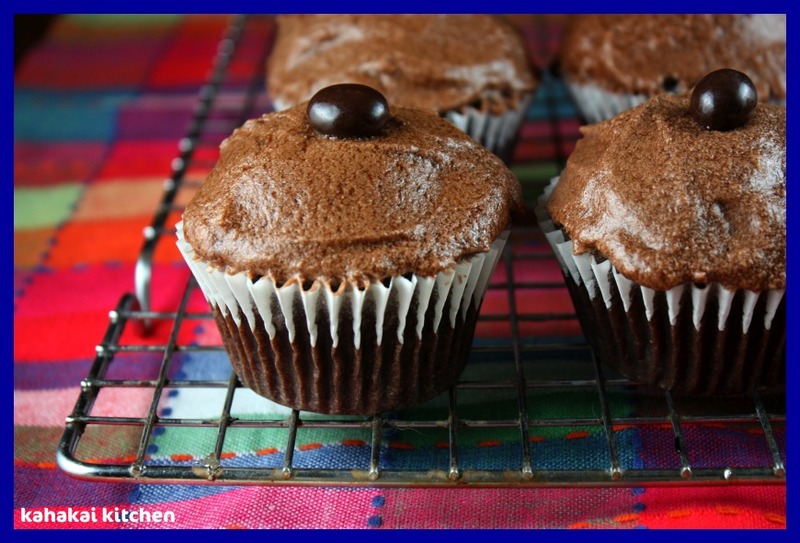 I have been wanting to finally try baking up a vegan chocolate and avocado pairing so Joy's Vegan Chocolate Avocado Cupcakes with Vegan Chocolate Buttercream seemed like the perfect opportunity. 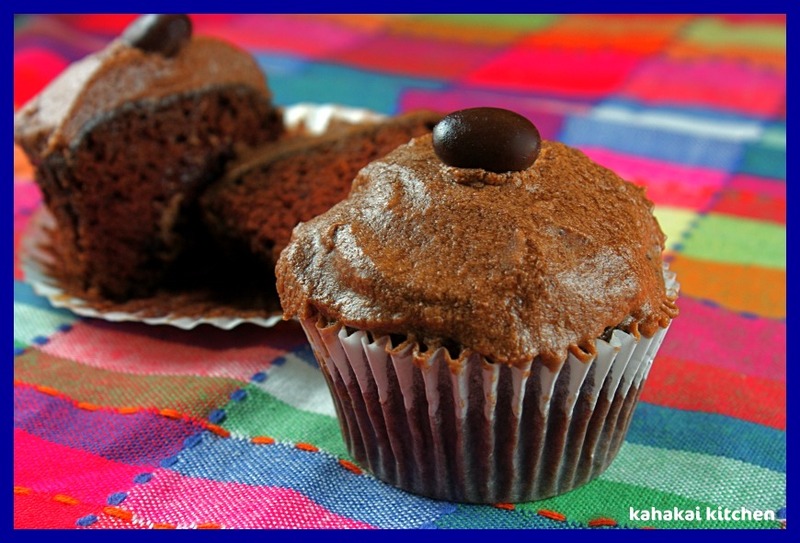 These cupcakes turned out incredibly moist and delicious. Sadly, the frosting wasn't quite a win for me. It kept separating and seemed somewhat greasy and a bit grainy. I used the Earth Butter sticks and followed the recipe, then I tried adding more powdered sugar, refrigerating it and re-mixing, freezing it, etc. but it wasn't quite as buttery and fluffy as I would have liked and it doesn't look that pretty. Of course it also had to compete with my memories of Joy's incredible chocolate buttercream with Ovaltine in it that topped the brownies on week one, and I don't think it could have done that even if it had turned out perfectly. All in all, these cupcakes were still excellent and no one would guess they are vegan--always a plus. Joy the Baker says, "This is the part of our baking journey that will make you raise your eyebrows at me. Yes, this fine chocolate cake has avocado in it. Avocados are so rich and creamy that I like to consider them the vegetable equivalent of butter. This vegan cake recipe uses both oil and avocado to create a moist, tender, and sturdy crumb. 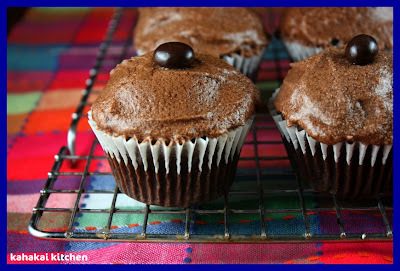 Combine the cake with vegan chocolate frosting, and you've got quite a treat. You won't have to tell a soul that there's avocado in the cake, unless of course, you want to brag. You can double this cake and frosting recipe to make one 2-layer 8-or9-inch cake." 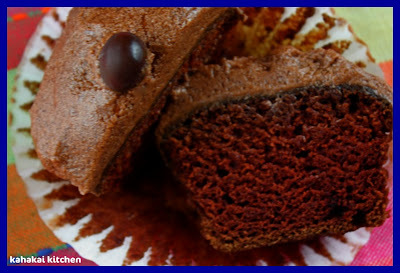 Place rack in the upper third of the oven, and preheat oven to 350 F. Line a cupcake pan with foil or paper liners. 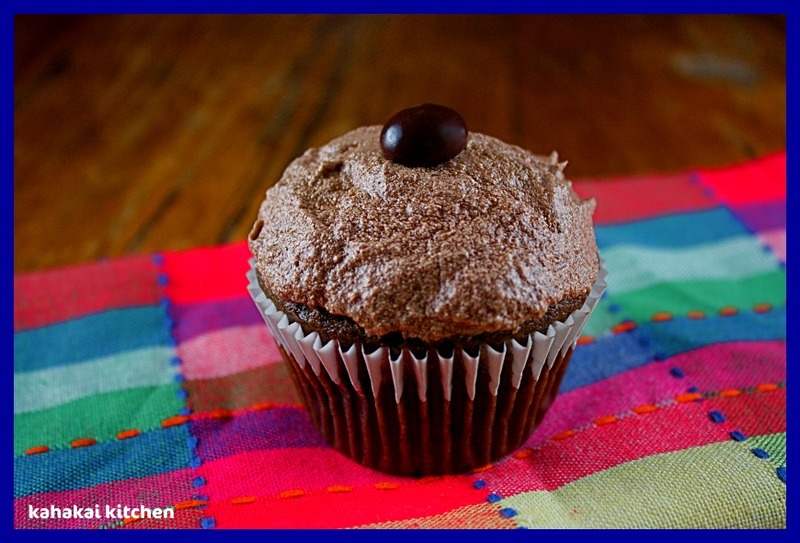 In a medium bowl, whisk flour, cocoa powder, salt, baking powder, and baking soda. Set aside. In a large bowl, whisk sugar, oil, avocado, water, vinegar, and vanilla. Add the flour mixture to the avocado mixture and fold with a spatula until well combined. The batter will be so loose that you can pour it into a measuring cup to dispense into the cupcake molds. Fill each cupcake liner until it’s about two-thirds full. Bake for 18 to 20 minutes or until a toothpick inserted into the center of the cupcake comes out clean. Let cakes cool for 10 minutes before moving to a cooling rack. Place butter in the bowl of an electric stand mixer fitted with a paddle attachment. Beat the butter on medium speed until soft and pliable. Stop the mixer, scrape the sides of the bowl, and add the cocoa and sugar. Turn mixer on low to slowly incorporate. Add the vanilla and soy milk. Increase the mixer speed to medium or medium high and beat until frosting is soft and fluffy. Spread onto cupcakes with a butter knife and decorate with sprinkles, if desired. Frosted cupcakes can last in fridge for up to 4 days. You're going to find me ridiculously redundant over the next two weeks then, because both of my recipes involve chocolate. Lots of chocolate. The cake part sounds delicious! As for the frosting...I might just go for my favorite avocado buttercream! I've never tried a vegan cupcake. those look really delish! Sorry the frosting wasn't a hit. But the texture of those cupcakes looks amazing! The texture of the cake looks fantastic. It's too bad about the frosting, but I agree with you that after you've had the ovaltine frosting everything else pales in comparison! Deb - I'm eager to try replacing oil and eggs with avocado. It seems like such an interesting substitute. The texture of the cupcakes looks incredible. Sorry to hear about the frosting. These look great, I once made chocolate pudding with avocados and it was awesome so I know your combo is a winner!